Pakistan election LIVE updates: polls close after attacks leave dozens dead: The campaigning in Pakistan has ended as the nation is now prepared to vote in the general election Wednesday. A fierce battle is all set to take place Between Imran Khan-led Pakistan Tehreek-e-Insaf (PTI) and Pakistan Muslim League-Nawaz (PMLN) led by Nawaz Sharif’s brother and former Pakistan Punjab Chief Minister Shahbaz Sharif. The survey and details of the public opinion survey will come on the Monday, which will be put the PTI slightly ahead of the PMLN. on the other hand, The survey has also found that 14 per cent of the respondents in Punjab province, the PMLN’s stronghold, remain now unclear. And, it is this group of voters who are hopefully going to determine the final result of the 2018 elections. As per the nationwide survey, PTI is leading with 29 per cent, followed by PMLN at 25 per cent and Pakistan Peoples Party led by Bilawal Bhutto Zardari at 20 per cent. Pakistan also follows the first-past-the-post system anyway. the third largest province of the country, Khyber Pakhtunkhwa, is home to 15.32 million voters (25 percent higher than 2013), 8.71 million of whom are male and 6.61 million female. Subsequent to this 25th constitutional modification, the region bordering it to the east—Federally Administered Tribal Areas (FATA)—has all set to merge with it. The earlier region of FATA had seven districts: is consists of the South Waziristan, North Waziristan, Mohmand, Khyber, Orakzai, Bajur, and Kurram. 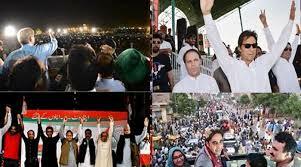 In the past three terms, Nawaz Sharif’s Pakistan Muslim League-Nawaz (PML-N) has won in Punjab, the Pakistan Peoples Party has won Sindh, and Balochistan gained some political forces that were connected with the feudal elements and the establishment. Though, voters of Khyber Pakhtunkhwa (earlier North West Frontier Province) have kept altering their preferences. Political analysts attribute this to the ‘political maturity’ of voters in the Pashtun region and this will be yet to see the outcome of this Pakistan Election of 2018.